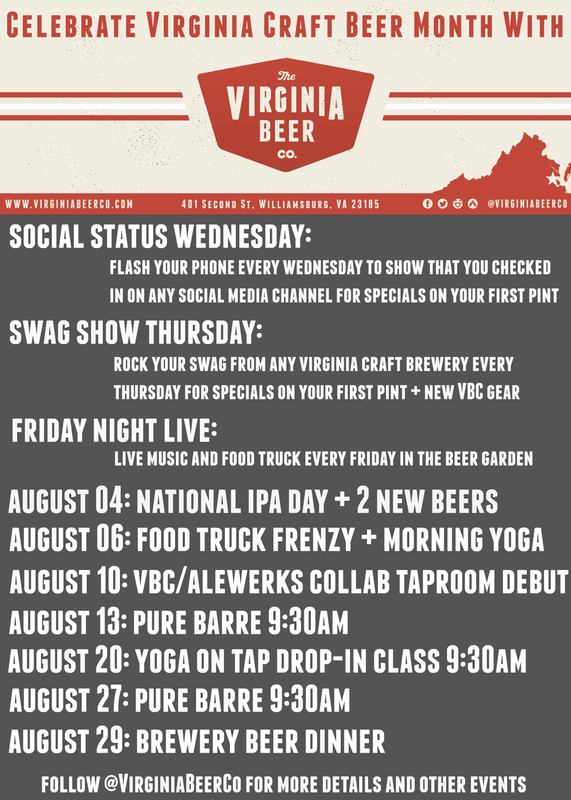 August is Virginia Craft Beer Month and we here at 401 are STOKED to finally be able to participate with our very own beers and our very own brewery. We have a bevy of amazing events scheduled throughout the month and more being added all the time. Food trucks EVERY DAY we're open plus new cask ales and live music EVERY FRIDAY. Click on the links below for more information about each event, and check back early & often for more. Ready for beers & cheers? We are! 8/5: Friday Night Live (6-9 pm) feat. music by Chisman Creek Band's Southern Junction + food by Creekside Catering Co.
8/6: Poses & Pints (9:30 am) + Food Truck Frenzy! 8/26: Friday Night Live (6-9 pm) feat. music by Robbie Kerns + food by Creekside Catering Co.
Last year, Team Virginia Beer Co. was invited to visit NYC for a Visit Williamsburg event. One Williamsburg visiting another...very existential! During this visit we had the pleasure of meeting Karen Schaler, host of Travel Therapy. As they say, all good things come to those who wait - last month, Karen made the trip to our own Williamsburg in Virginia. She visited a number of spectacular locations in the area including The Williamsburg Winery, Alewerks Brewing Company, and Silver Hand Meadery. We had just started brewing a couple weeks prior, and we were fortunate enough to also host Karen during her tour! Check out the video below and make plans to visit all of these great Williamsburg area destinations this spring! TRAVEL THERAPY with Karen Schaler Featuring Greater Williamsburg, Virginia as Hidden Gem Winter Romantic Escape for Couples. See Karen's top foodie finds, resorts, spas and craft beverages.